Broadsheet newspapers are the “big” ones like The Australian, The Sydney Morning Herald and The Age. 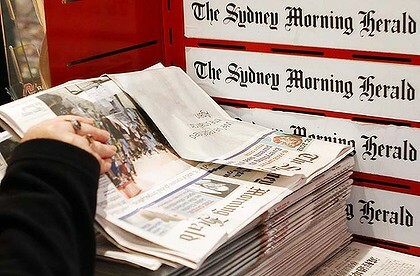 as of 4th March 2013 and after 181 years as a broadsheet, the Sydney Morning Herald is switching to a tabloid, or as they like to call it “compact”. Tabloid newspapers are “small” ones like the Melbourne Sun, The Daily Telegraph , the Adelaide Advertiser and (now) the Brisbane Courier-Mail . Tabloids are usually (not always) more sensational, and the broadsheets are usually (not always) more serious. That’s why the expression “tabloid journalism” is usually a derogatory term meaning cheap sensational journalism. The much revered London Times has changed from a broadsheet to tabloid size.